Have you ever wondered about the various design styles you hear the experts talk about on the television home restoration shows? What are the various architectural and furniture styles and what are the main features or each style? Architectural styles and interior design styles have changed throughout history from primitive to modern. While most designers prefer to stick to one particular style, it is not unusual to combine styles for a more eclectic look. This will give a a snapshot of the major styles and the main characteristics of each style. Beginning with the arrival of the first American settlers, the Colonial period included not only early primitive, but incorporated various styles from the regions the settlers came from. Architecturally, the period ranges from rustic to more sophisticated. Primitive decorating has a rough simple look with muted colors. Furniture is square with peg legs and grained wood. It often incorporates folk art such as stars and antique window frames. 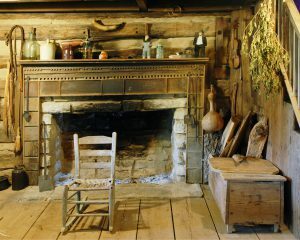 Primitive style used raw materials such as iron, brass, and wood with most of the hardware being hand forged by blacksmiths. 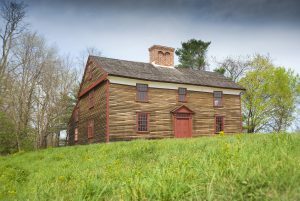 In the later 1700’s, early primitive structures evolved into brick or stone homes, or wood homes with clapboard siding. Most homes also had brick fireplaces. The primitive/colonial theme is the inspiration for today’s country and shabby chic styles. 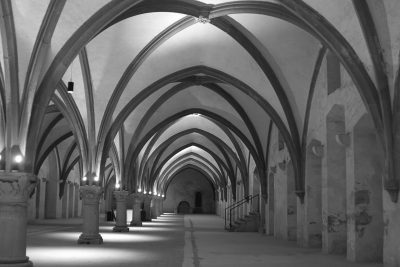 Also called Victorian Gothic or Neo-Gothic, Gothic Revival began in England in the 1740’s and quickly spread to America as a revival of classic medieval Gothic architecture. Gothic Revival style includes characteristics of medieval architecture with high cathedral-like arches, steeply pitched roofs, and gingerbread window trim. Hardware echoed the themes of European castles and parapets with dark finishes giving an aura of nostalgic European history. Other characteristic include stained glass windows, decorative patterns, finials, and use of scalloping. Victorian style of architecture is a design style developed during the reign of Queen Victoria of England and one of the most recognizable and most popular styles in both architecture and design. Victorian homes are usually large and imposing with two or three stories and have asymmetrical shapes with wings and bays. With the Industrial Revolution in full swing during this period, for the first time mass production made products affordable for anyone. 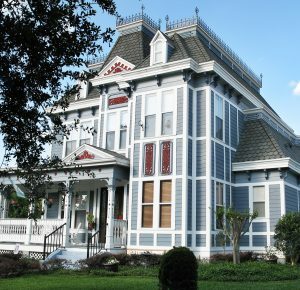 Homes became more ornate with decorative gingerbread trim, scalloped shingles, and wood or metal trim. Roof lines on Victorian homes are steep with many gables. 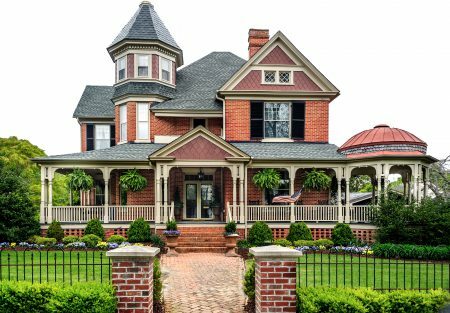 Many high-end Victorian homes also feature round or octagonal towers. Drawing its influence from Gothic style, Victorian furniture is heavy with dark finishes and elaborate carvings and ornamentation. Victorian style often includes interpretations of historical styles mixed with Middle Eastern and Asian influences. 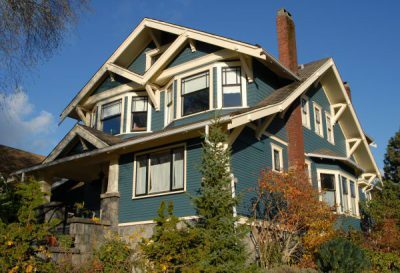 Designers often add French, Italian, Tudor, Queen Anne, and Eastlake details so no two Victorian homes are exactly alike. Victorian hardware styles include the use of brass and bronze with most being ornate and detailed. Eastlake style is named after English architect and writer Charles Eastlake and is part of the Queen Anne style of Victorian architecture. As a reform movement, Eastlake style moves away from the large carved furniture pieces to a simpler style. Eastlake furniture features low relief carvings, incised lines, geometric ornaments, and more flat surfaces. Eastlake furniture accentuates the grain with oils and other natural finishes rather than the dark finishes associated with Victorian style. In contrast with other Victorian styles of furniture produced in America featuring classicaldesigns, Eastlake furniture incorporates more modest curves with hint of modernism. While coinciding with the Victorian period, Eastlake style is less ornate with modest lines and lightly incised lines as opposed to more deeply carved woods in Victorian style furniture. Eastlake style also incorporates the use of nature themes, including simple plant and animal details. Eastlake also sometimes incorporates an Asian influence. Ebony pieces are also used from time to time. 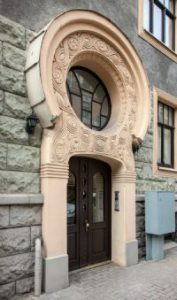 As an important transition between eclectic Historic Revival and Modernism, Art Nouveau, or New Art, is an artistic style and design philosophy popular from the 1880’s to just before World War I. The style is inspired by nature and includes flowers, plants, vines, and insects. Art Nouveau was a means of blending architecture with the natural environment. This New Art style was an attempt to get away from the historical styles of the 19th century and its mass production and to revive skilled craftsmanship combined with modern design. 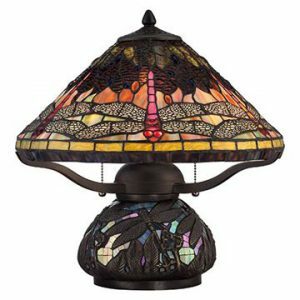 Unlike the ornate Victorian style, Art Nouveau stresses curved lines, natural arches, and organic themes. Many champions of the style found 19th century design too ornamental and emphasized function over form. Many view Art Nouveau as a revival of classic Gothic style. This short-lived style was replaced by the Art Deco style just after World War I. Art Nuveau style experienced a revival in the 1960’s as an important predecessor of modernism. First appearing in France after World War I, Art Deco is an eclectic style combining traditional motifs with mechanized materials. The style, which is experiencing a revival today, is characterized by bold geometric shapes with long sinuous lines, sharp edges, and bold colors. Unlike the nature inspired themes of the Art Nouveau style, Art Deco embraces technology and industrialization. During the height of its popularity, Art Deco represented glamour, luxury, and high style. Materials in Art Deco include stucco, concrete, smooth-faced stone, Mosaic tile, and terracotta, along with steel, aluminum, neon, and glass. Metals include highly polished brass, chrome and nic kel. Expensive materials including marble, ebony, and rare woods are sometimes used. Colors are bold with lots of contrast and include deep yellows, reds, greens, blues, and pinks mixed with silver, black and chrome. Furniture is large scale and made of exotic woods. Sideboards, armoires, and over-sized chairs are typical of the period. Fabrics are solid or geometric patterns – no florals or plaids. Animal prints are also popular in Art Deco. 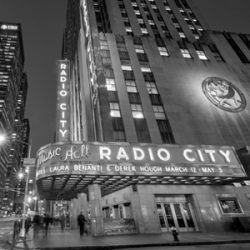 Famous American buildings in this style include the Chrysler Building, Empire State Building, and Rockefeller Center, and Radio City Music Hall in New York; the Cincinnati Union Terminal; numerous buildings in Miami’s South Beach; and many buildings across the country. The Arts and Crafts movement began in England in the late 1800’s as an alternative to the ornate Victorian style and factory produced furniture. The movement featured simple designs emphasizing traditional craftsmanship. By 1910, the style had reached America. The style is inspired by nature with earthy elements like wood, botanicals, stone, copper, water symbols being prominent design elements. In Arts and Crafts style, the focus is on the wood. It is quite rare to see painted wood in an Arts and Crafts design, but rather showcasing the natural beauty of the grain. Oak is a favorite wood of this style. Color choices are organic including browns, yellows, and greens with lighter hues and neutral wall colors. Accent colors include colors found in nature such as golds, blues, and forest green. Fabrics also lean toward the botanical and natural themes with strong textures and geometric shapes. Lighting is one of the few places where you can add some pizzazz with the easily recognizable Tiffany-inspired lamps and fixtures. Stained glass windows are often found in the Arts and Crafts home. Metals are warm and include bronze, copper, oil rubbed bronze, or antique brass and are often hammered or distressed. Chrome and steel are definitely out of place in the Arts and Crafts home. 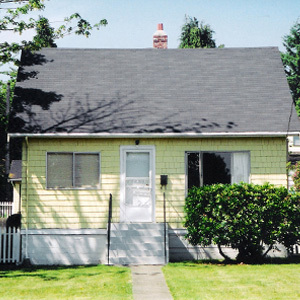 The Craftsman home is recognized by its low-pitched gabled roofs with wide overhangs and squared porch posts. Names synonymous with Arts and Crafts include Gustav Stickley, William Morris, and Frank Lloyd Wright. With metals scarce during World War II, designers and manufacturers turned to glass for cabinet and door hardware. Glass was readily available and could be offered in many colors. 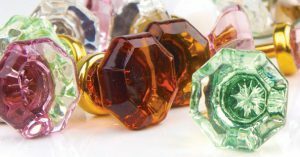 Depression Era glass, as it has become known, came in colors that included cobalt blue, depression green, pink, amber, milk white, blackand clear. Depression glass was mass-produced generally of low quality, but it was affordable. Many glass items were free inside boxes of products or offered free with purchase of goods and services. Door knobs also moved away from basic round knobs to includ e fluted and octagonal-shaped, with hexagonal knobs with bridge handle used on cabinets. Other popular materials used were aluminum and bakelite. Architecture during this period featured a horizontal orientation with rounded edges and corners. Flat roofs were also popular. 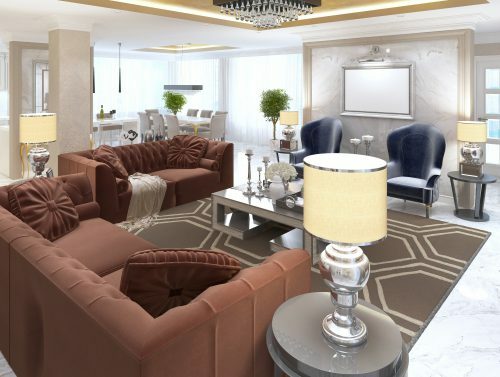 Interior colors were typically light earth tones of off-white and beige with trim colors being darker. Traditional style has been described as calm, orderly, and predictable. It features basic designs that are clean and will blend seamlessly with virtually any other time period. It is a style that is warm and inviting and emphasizes comfort and ease of living. Traditional home furnishing come from anything from Victorian to Oriental. 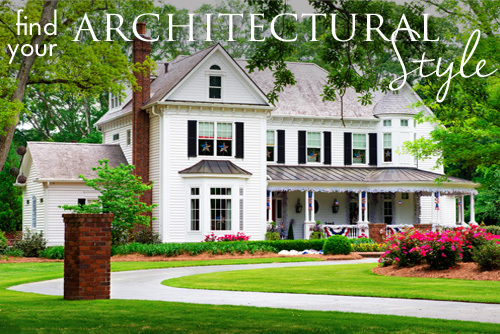 Popular styles in the traditional style include Colonial revival, Neo-classical, and French Country. Furniture is typically grouped in formal arrangements and positioned along the axis of the room. One of the great things about traditional is furniture pieces do not have to match. Tables, small rugs, and wall art are to break up the angles so the room doesn’t look static. Color schemes are generally subtle and laid back with neutral colors such as tan, beige, and cream along with deeper browns, greens, and blues. Accent with bright shades of yellow and turquoise. 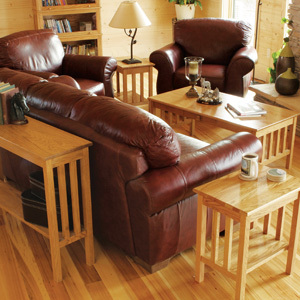 Dark woods including cherry, oak, cedar, and mahogany are predominate in traditional style. Hardwood floors are the choice for flooring along with Oriental or Persian rugs as accents. Wall accents include wood touches and millwork including crown molding with egg and dart motifs. Large mantels are used as a focal point in the room. Room accessories can be mix and match to include florals, stripes, and plaids as long as they are in the same color palette. Modern or Mid-Century Modern style is all about form and function. There is no clutter here. Rooms are open with simple shapes and designs. Furniture is minimal with the focus on the function of each piece used in the design. Furniture is off the floor to add to the airy, open feel. In this design style less is more. The predominant colors in Modern style are white and black with reds, yellows, and blues used sparingly to add some pop. Chrome and stainless steel are commonly used particularly with glass table tops. Contemporary, like Modern, features clean lines, open floor plans, and minimal clutter, but is different in that it reflects current trends. What is considered Contemporary style now will not be Contemporary in twenty years. Colors are neutral with brighter colors used as accents. Wall colors are white or neutral with tone-on-tone patterns. Floors are bare and done in wood, stone, or laminate. Carpeting is neutral colors. In both Contemporary and Modern, window treatments are minimal. Van Dyke’s Restorers is your source for hard-to-find house restoration hardware and wood. We offer a wide variety of hard-to-find specialty hardware and components for restoring antique desks, tables, chairs, dressers, hoosier cabinets and much more. If you are remodeling or building and you aren’t interested in creating a cookie-cutter home, we have handcrafted and custom pieces that will put the perfect personal touch on your restoration! Check us at at www.vandykes.com.